UA requires that all first time, full-time students live on campus for the entirety of their first year to provide students with a comprehensive educational experience. Students first enrolling in the summer: required to live in the residence halls for summer, fall, and spring semesters. Students first enrolling in the fall: required to live in the residence halls for fall and spring semesters. Students first enrolling in the spring: required to live in the residence halls for spring semester. We do not automatically grant exemptions and consider each as it is submitted. Generally, HRC notifies students whether the exemption is granted in 2-4 weeks (processing time vary due to holidays/University closings). To access the exemption request form, log in to your myBama account. 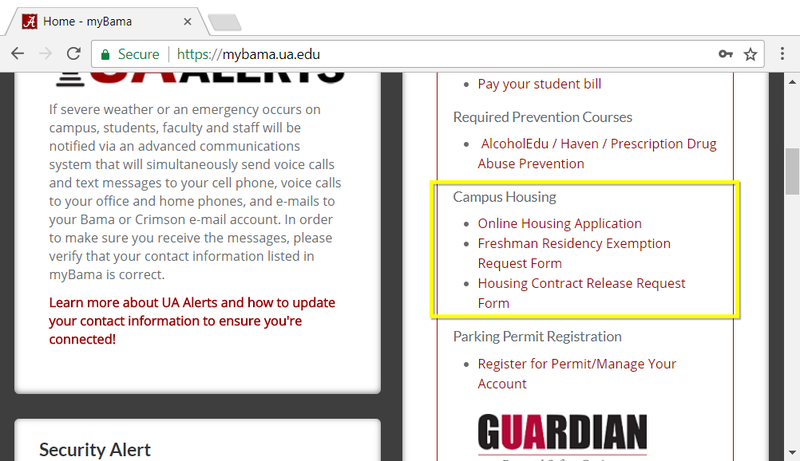 On the Home tab, select “Housing Exemption Request Form” from the right column titled ““Currently on myBama” under the “Campus Housing” header.